Rubber Processing Chemicals Market size is forecast to exceed USD 5.3 billion by 2025; according to a new research report by Global Market Insights. Global rubber processing chemicals market will be primarily driven by rapidly increasing automobile industry. According to latest OICA reports global automobile sale in 2017 was 97 million vehicles. This massive size of the automobile industry shall fuel the product demand in near future. In addition, positive growth number from the construction industry are likely to help the rubber processing chemical market to grow further. Product is used in the construction industry in roofing materials, floor covering, sound insulators and sealants. However, rubber chemicals are facing stringent regulations by government due to hazardous impact of the product on human health and environment. This is likely to hamper the product demand over the forecast timespan. Furthermore, the tire industry is shifting from conventional tires to green tires. This shift in the industry is anticipated to curb the rubber processing chemicals market size in near future. in 2017, accelerator product segment generated revenue over USD 1.5 billion in rubber processing chemicals market and it is projected to experience a highest CAGR during the forecast period. These are used to accelerate the production speed. It reduces the rubber production time up to one tenth and contribute to fast and economical production of good quality rubber. Crude rubber can acquire high elasticity by using the accelerators while rubber manufacturing. With increasing usage and application of rubber across the globe, accelerators rubber chemicals are anticipated to experience a healthy growth in demand near future. Anti-degradant rubber chemicals are likely to experience the significant growth number over the forecast period. Anti-degradant rubber chemicals improve the rubber's resistance to the effects of sunlight, oxidation, ozone, mechanical stress and heat. 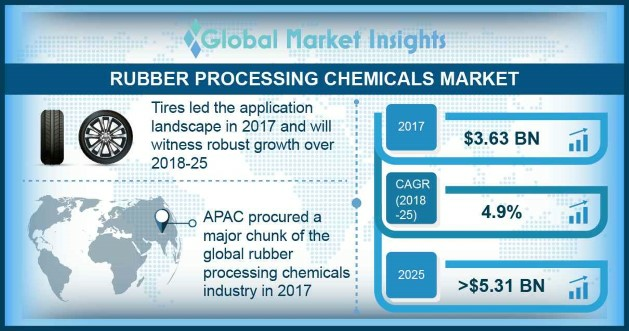 Tire was the largest application segment for rubber processing chemicals market in 2017 and is forecast to grow with a highest CAGR due to escalating automobile sales across the globe. Non-tire application segment is likely to experience increasing demand during the forecast period. This can be attributed to the increasing industrialization and construction activities in major part of the world. Asia Pacific is anticipated to grow with a highest CAGR over the forecast timeframe 2018-2025. Automobile is the major end-user in rubber chemicals market and 40% of automobile production is done China, due to which Asia Pacific registered highest product demand in 2017 with holding more than 60% market share. North America rubber processing market shall grow with a prominent CAGR in near future, owing to the presence of major automobile manufacturers in the U.S. Giant multinational players are operating in the rubber processing chemicals market. Some major players working in the industry includes, BASF SE, Solvay S.A., Kumho Petrochemicals, Eastman Chemical Company, AkzoNobel N.V., Emerald Performance Materials, Linkwell, Sumitomo Chemicals, R.T. Venderbilt Holding Company, Inc., Merchem Ltd and Pukhraj Additives LLP.